The star could be as old as 14.5 billion years (plus or minus 0.8 billion years), which at first glance would make it older than the universe’s calculated age of about 13.8 billion years, an obvious dilemma. 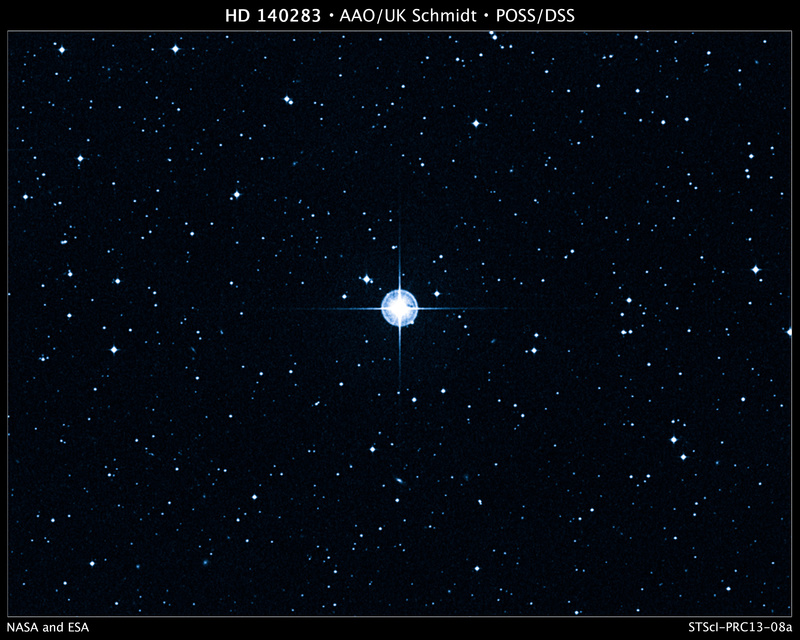 This “Methuselah star,” cataloged as HD 140283, has been known about for more than a century because of its fast motion across the sky. The high rate of motion is evidence that the star is simply a visitor to our stellar neighborhood. Its orbit carries it down through the plane of our galaxy from the ancient halo of stars that encircle the Milky Way, and will eventually slingshot back to the galactic halo. Hubble’s observational prowess was used to refine the distance to the star, which comes out to be 190.1 light-years. Bond and his team performed this measurement by using trigonometric parallax, where an apparent shift in the position of a star is caused by a change in the observer’s position. The results are published in the February 13 issue of the Astrophysical Journal Letters. The parallax of nearby stars can be measured by observing them from opposite points in Earth’s orbit around the sun. The star’s true distance from Earth can then be precisely calculated through straightforward triangulation. Once the true distance is known, an exact value for the star’s intrinsic brightness can be calculated. Knowing a star’s intrinsic brightness is a fundamental prerequisite to estimating its age. Before the Hubble observation, the European Space Agency’s Hipparcos satellite made a precise measurement of the star’s parallax, but with an age measurement uncertainty of 2 billion years. One of Hubble’s three Fine Guidance Sensors measured the position of the Methuselah star. It turns out that the star’s parallax came out to be virtually identical to the Hipparcos measurements. But Hubble’s precision is five times better that than of Hipparcos. Bond’s team managed to shrink the uncertainty so that the age estimate was five times more precise. With a better handle on the star’s brightness Bond’s team refined the star’s age by applying contemporary theories about the star’s burn rate, chemical abundances, and internal structure. New ideas are that leftover helium diffuses deeper into the core and so the star has less hydrogen to burn via nuclear fusion. This means it uses fuel faster and that correspondingly lowers the age. Also, the star has a higher than predicted oxygen-to-iron ratio, and this too lowers the age. Bond thinks that further oxygen measurement could reduce the star’s age even more, because the star would have formed at a slightly later time when the universe was richer in oxygen abundance. Lowering the upper age limit would make the star unequivocally younger than the universe. The star retains its elongated orbit from that cannibalism event. Therefore, it’s just passing through the solar neighborhood at a rocket-like speed of 800,000 miles per hour. It takes just 1,500 years to traverse a piece of sky with the angular width of the full Moon. The star’s proper motion angular rate is so fast (0.13 milliarcseconds an hour) that Hubble could actually photograph its movement in literally a few hours. The Hubble Space Telescope is a project of international cooperation between NASA and the European Space Agency. NASA’s Goddard Space Flight Center in Greenbelt, Md., manages the telescope. The Space Telescope Science Institute (STScI) in Baltimore, Md., conducts Hubble science operations. STScI is operated by the Association of Universities for Research in Astronomy, Inc., in Washington.